The 1267th round of Tiger Woods's professional career was the worst of the lot. It was his highest single-round tally and guaranteed a depressingly early departure from the Arizona desert. His miserable 82 in the second round of the Phoenix Open led to only the 12th missed cut of the 39 year old's career. This is a statistic that puts this latest setback in its proper context. Woods still has more major victories (14) than halfway exits. This is an astonishing feat that illustrates his golfing greatness while highlighting the seriousness of his current decline. Despite all of the injury setbacks in recent years, the erratic driving (into hazards and hydrants) and an erosion of that once infallible putting stroke, his current struggles are still stunning to witness. There was no-one better at scrambling when Woods was at the height of his powers. He would always find a way to pick up par-five birdies or grind out vital saves with the most reliable of chipping games. Yet now we are talking yips rather than chips. Will it be fat or thin? Will the ball make it to the green or will it scud uncontrollably across the putting surface? It is a brutal guessing game for those of us watching with almost car crash curiosity. What is more, Woods seems to have no idea what will happen when he settles over these short shots around the green. Out: 10th (par 4) 4; 11th (par 4) 5; 12th (par 3) 3; 13th (par 5) 5; 14th (par 4) 6; 15th (par 5) 8; 16th (par 3) 3; 17th (par 4) 5; 18th (par 4) 5. In: 1st (par 4) 4; 2nd (par 4) 4; 3rd (par 5) 5; 4th (par 3) 5; 5th (par 4) 3; 6th (par 4) 5; 7th (par 3) 4; 8th (par 4) 3; 9th (par 4) 5. This is Tiger Woods we're talking about! Stats like his two-out-of-10 success rate for up-and-downs in that ruinous 82 would have been unthinkable earlier in his career. Now he is battling to be eligible for the next World Golf Championships event at Doral in March. Woods not good enough for a WGC? Yes, it is getting that bad. He is projected to fall to 56 in the world and he needs to return to the top 50 next month to force his way into the field for an event he has won seven times. So how does he go about reversing the current trend? Woods's plan to get in four solid rounds and then attend the Super Bowl in Phoenix lies in ruins. Tiger Airways has already whisked him home to Florida for more "reps" as he seeks to bed-in a new injury-proof swing. The range provides the solitude and seclusion to enable him to continue what he calls "the process". However, the former world number one also needs competitive golf after last year's injury-ravaged season. It is one thing to find a reliable chipping action on the practice green but quite another to then replicate it in competition. Only when he achieves an up-and-down that truly matters can confidence grow in a department that is so vital to good scoring. 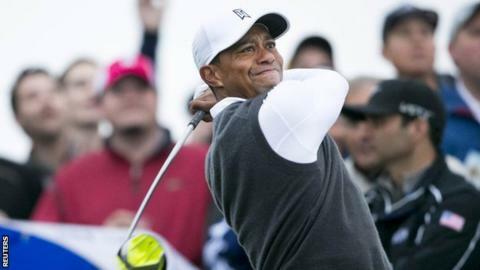 So now it is a Catch 22 situation - does he hunker down on the range in Florida or head to Torrey Pines, the site of his last major win - the 2008 US Open, for next week's PGA Tour stop? Rarely does he duck a challenge and there is every chance he will head to San Diego. There is no doubt these are worrying times for Woods, but he has always possessed a cussed determination throughout his remarkable career. Yes, it is only two rounds and one tournament so far this year, but this flinty quality is the one he needs most while seeking the spark to reverse what is an alarming current decline.